PARTNER NEWS: Banks can now use a service from NFC payments specialist Dejamobile to let new customers open a bank account, confirm their identity using approved Know Your Customer (KYC) procedures, request and receive an NFC bank card and begin making mobile payments — all from their smartphone and in under five minutes. The service can be deployed today in any country that has an online KYC provider and an issuing processor able to handle instant issuance, Dejamobile CEO Houssem Assadi told NFC World. Dejamobile is demonstrating the service at Mobile World Congress this week, on stand 5B41 in Hall 5. 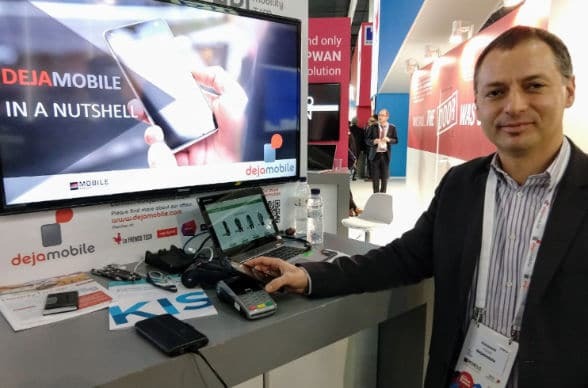 For the demo, the company has integrated with France-based mobile network operator Orange’s Mobile Connect service and online KYC provider Yousign to show how the service could be used by a bank in France to seamlessly onboard a new customer. Dejamobile uses Orange’s Mobile Connect platform to perform a SIM authentication, enabling it to verify that the customer’s name and address is the same as that held by the carrier. The customer takes a photo of their national ID card using the camera on their smartphone. Their details are then verified by Yousign, using its KYC API. The customer takes a selfie which is used to verify their face against the photograph on their national ID card. The customer scans the 2D barcode on a utility bill, to compare their name and address with that held by the utility provider. The customer is then issued with a bank account number and a mobile banking PIN, sent via SMS, which they use to access the bank’s mobile banking app. There, they are presented with the option of adding a bank card to their new account and can use Dejamobile’s existing provisioning service to be issued instantly with an NFC mobile payments card that they can start using straight away. Integrating with alternative KYC providers and processes in a bank’s own home country is “relatively straightforward”, Assadi says, and can be handled either by Dejamobile itself or in collaboration with a local partner. Availability of an operator offering Mobile Connect is optional.